Peroxisomes are cytoplasmic organelles. De-Duve and co­workers isolated peroxisome from liver cells and some other tissues. They are present in both animals and plants. They are also found in protozoa, yeast, and many types of cells of higher plant. 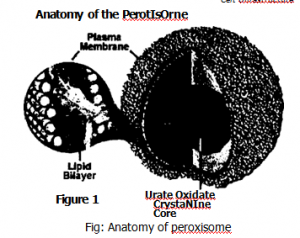 Peroxisomes are enclosed in a single membrane. Their size is 0.5 pm in diameter. In some mammalian tissues peroxisomes form an extensive reticulum (network). They contain more than 50 enzymes. 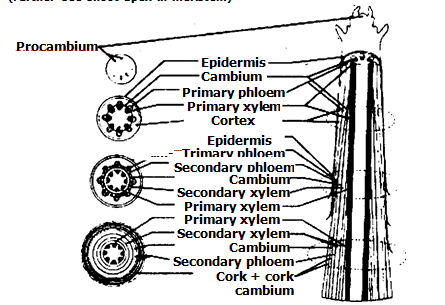 Peroxisomes self-replicate by enlarging and then dividing. They contain H202 — producing enzymes like oxidase and catalases. They also contain some oxidation enzymes like peroxidase, Catalase, glycolic acid oxidase and some other enzymes. Proteins are selectively imported into peroxisomes. 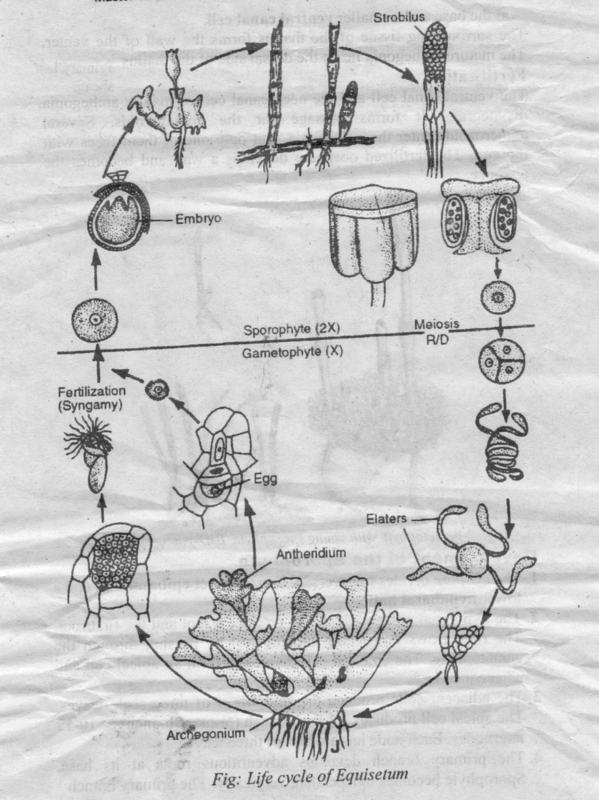 Peroxisorne contains no DNA or ribosomes. Therefore, they have no means of producing proteins. Thus all of their proteins are imported across the membrane. Peroxisomes are important for lipid metabolism. In humans, oxidation of fatty acids greater than 18 carbons in length occurs in peroxisomes. In yeast, all fatty acid oxidation occurs in peroxisomes. A major function of the peroxisome is the breakdown of fatty acid molecules in a process called beta‑oxidation. 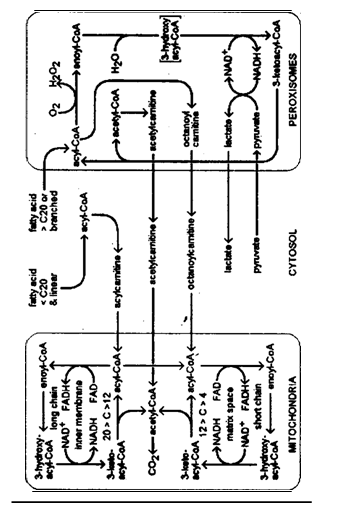 In this process, the fatty acids are broken down in to Acetyl-CoA. It is then transported back to the cytosol for further use. A deficiency in the protein in peroxisomes causes abnormalities in the brain, called Zellweger syndrome. 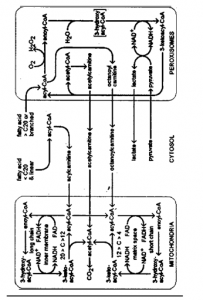 A deficiency in the peroxin Pex2 is responsible another form of syndrome.